19.43 IST: 217 minutes. 375 runs. 11 wickets. 237 balls. What a match. Mumbai batted first and raked up 187. Rajasthan were coasting through till the 14th over. But the game, funny that it is, shocked one and all as the visitors collapsed, only to somehow sneak through. 19.38 IST: Hardik Pandya to Shreyas Gopal, FOUR! Here it is... RAJASTHAN WIN BY 4 WICKETS! Pandya offers a bit of room around off, Shreyas Gopal gives it the full whack of his bat and slaps it over extra cover for the winning runs. Rajasthan break their losing streak, their dugout is all pumped up! 19.37 IST: Hardik Pandya to Shreyas Gopal, IN THE AIR... DROPPED! The batsmen take two, two important runs. Back of a length ball on off, Gopal stands tall and lofts it over mid off. The fielder runs back to attempt for the catch but fails to hold on. It rolls behind and the long on fielder stops it from crossing the rope. 19.33 IST: Jasprit Bumrah to Shreyas Gopal, FOUR! 19.31 IST: Jasprit Bumrah to Krishnappa Gowtham, NOT OUT!MISSING LEG. Cannot blame the fielding unit for taking the review. It was a yorker, fired in on middle and leg and Gowtham was looking to flick, getting across. Was hit on the pads and up went Bumrah but the umpire was firm. There is a massive team meeting and just when the time remaining for DRS says 1 second, Rohit smilingly takes the review. Hawk Eye does not support the hosts though. 19.29 IST: Krishnappa Gowtham comes in now at number 8. 19.27 IST: Jasprit Bumrah to Steve Smith, OUT! Caught behind! Is that the game? Is that the game? Rajasthan pulling off a sensational choke here. A length ball outside off, Smith looks to force it through the off side but the ball comes back in, cuts him for room and goes through. There is a noise and the keeper appeals but the umpire is unmoved. However, Smith walks and the hopes of Rajasthan sink. 19.22 IST: Krunal Pandya to Rahul Tripathi, OUT! Tripathi holes out and Mumbai have got 2 wickets in the span of 3 balls! Time for a choke? Full and outside off, Tripathi reaches out and looks to play the slog sweep. Seems to connect well too but to his dismay, the hit is flat, lacking elevation. Hardik Pandya races to his left from deep mid-wicket and accepts the catch. Scoreboard pressure... 17 needed from 17. 19.18 IST: Jasprit Bumrah to Sanju Samson, OUT! LBW! The decision stays as it is and Rajasthan are very lucky that they do not lose a review. Samson walked across his stumps and Bumrah lined it very straight, from over the wicket. Sanju missed his flick and was hit dead straight in front of the stumps, prompting an LBW appeal and the raise of the umpire's finger. Smith was adamant that this was missing leg and forced Samson into the review. Hawk Eye shows it to be clipping leg stump. Now then. Mumbai get the set batsman. Relatively two new batsmen at the crease. Are we in for another humdinger? 18 needed from 19 balls. 19.11 IST: Strategic time-out! 4 overs left. 20 needed. Rajasthan should get home from here. But... you never know. Cricket is a game of uncertainties. If Mumbai can get Samson, then Bumrah is always there for death over miracles. Jasprit Bumrah is back on. 2-0-13-0 so far. 19.13 IST: Krunal Pandya to Steven Smith, FOUR! Off the edge! Full and outside off, Smith looks to sweep but gets a top edge. Hardik Pandya starts to give it a chase from short third man and thinks of pulling it back but then eventually looks to chase. Then he tries to pull it back again, but in the end, is late. 19.00 IST: Rahul Chahar to Jos Buttler, OUT! 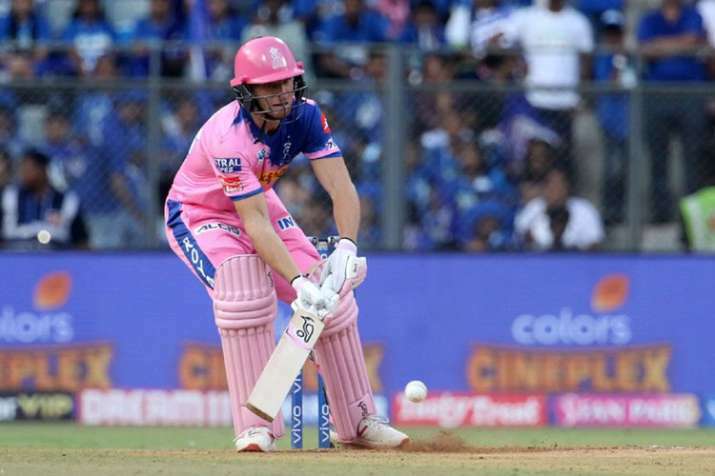 No century for Buttler but his 89 might prove enough to give Rajasthan a couple of points tonight. Full and outside off, Buttler, who is in six-hitting mood, looks to go big. But he is done in by the turn and miscues it towards long off. Simple catch for Suryakumar Yadav. Replays show that Chahar bowled that from almost behind the wickets. So along with the turn, the lack of pace was also the issue. Well played, Jos. 19.00 IST: Alzarri Joseph to Jos Buttler, SIX!28 from the over! Has this over turned the tide completely? 18.59 IST: Alzarri Joseph to Jos Buttler, FOUR! Another boundary! This is sensational batting. Full and outside off, this time Buttler just opens the face of his bat and steers it past short third man! 6, 4, 4, 4, 4. What is coming on the final ball? 18.57 IST: Alzarri Joseph to Jos Buttler, EDGED, FOUR! This is hard luck on the bowler. 18.56 IST: Alzarri Joseph to Jos Buttler, FOUR! Short and outside off, this is bad bowling, Buttler brings out his square cut and beats the man racing to his left from sweeper cover! 18.54 IST: Alzarri Joseph to Jos Buttler, SIX! Going, going and gone! That is the third time in this innings that an over has begun with a biggie. A length ball, on middle, Buttler just swings this through the line and clears long on! 18.52 IST: Rahul Chahar to Sanju Samson, SIX! Second one of the over! 18.50 IST: Rahul Chahar to Jos Buttler, SIX! Up, up and away! First ball of a new spell and Buttler has given the 19-year old a splendid welcome. * Rahul Chahar is back on. 2-0-12-0 so far. 18.48 IST: Jasprit Bumrah to Jos Buttler, A jaffa to begin the new spell. Bumrah hits the deck hard and gets it to move away a touch. Buttler pokes at it but misses. Jasprit appeals for a catch but no one else is interested. 18.44 IST: Jason Behrendorff to Jos Buttler, FOUR! A wristy shot! Full on leg and Buttler waits for it and flicks it towards the fine leg boundary. 18.40 IST: Jason Behrendorff to Sanju Samson, FOUR! Beautiful and graceful. A full length delivery on off, Samson just lifts it above covers for a boundary. 18.34 IST: Rahul Chahar to Jos Buttler, SIX! CREAMED! Turn or no turn. Bowl too full and you go for plenty. Tossed up outside off, Buttler gets down and slogs it high and handsome over long on! * STRATEGIC BREAK. Neck-and-neck are the two teams at this stage. Mumbai were firing in the evening sun while Rajasthan have started nicely with the dew set to come. A good platform is essential for a solid performance. Can the middle order make use of this? 18.27 IST: Jasprit Bumrah to Jos Buttler, FOUR! Second one from the over! A short delivery by Bumrah this time, Buttler gets into position early and pulls it with ease towards the square leg region. 18.24 IST: Jasprit Bumrah to Ajinkya Rahane, FOUR! Classy! A juicy half volley on off, the one which batsman plays in nets for practice. Rahane with ease plants his legs and cover drives it for a boundary. 18.20 IST: Alzarri Joseph to Ajinkya Rahane, SIX! Rahane opens his arms. A length delivery on off, Rahane makes maximum use of it. Powers it towards the mid-wicket region for a six. 18.18 IST: Alzarri Joseph to Ajinkya Rahane, FOUR! Welcome back into the attack, mate! Full and outside off, Rahane leans and lofts it beautifully over cover. There is a man sweeping that region from point but cannot get there. Rahane moves to 21 from 14 balls. His 4th boundary. 18.15 IST: Rahul Chahar to Jos Buttler, SAFE! The impact indeed is the issue, it's with the umpire's call. Mumbai are lucky to retain the review. 18.13 IST: Shout for an lbw! It's not given and Mumbai have taken the referral. Is impact an issue? * Spin time! Rahul Chahar to bowl his leggies. A slip in place. 18.08 IST: Jason Behrendorff to Jos Buttler, SIX! Gorgeous! All timing, zero power. Just goes through with his shot with a lot of class. Behrendorff serves it on a length around off, angling away, Buttler lofts it nonchalantly over long off for a maximum. The word effortless defines this shot better. 18.06 IST: Jason Behrendorff to Ajinkya Rahane, FOUR! Boom! That's a great shot from Jinx! Just a slightly short of a length ball on off, Rahane turns on the back foot and smashes it over mid-wicket for a boundary. 18.05 IST: Alzarri Joseph to Jos Buttler, FOUR! Innovation from Buttler. A full length delivery on off, Buttler shuffles across the off and paddles it towards the vacant deep fine leg region. 18.03 IST: Alzarri Joseph to Jos Buttler, FOUR! A length ball outside off, Buttler goes over cover and finds the fence. His first boundary. * Alzarri Joseph to bowl from the other end. 18.00 IST: Jason Behrendorff to Ajinkya Rahane, DROPPED AND FOUR! Behrendorff pitches up this time, around off and Rahane tries to play the lofted shot down the ground. But the bat turns in his hands and he mistimes it in the air towards mid off. Rohit Sharma reacts to his right but then fails to catch it as it goes right through his hands to the long off fence. 17.56 IST: Jason Behrendorff to Ajinkya Rahane, Starts with a length ball on middle, Rahane closes the face his bat and pushes it to mid-wicket. 17.49 IST: Jofra Archer says that the ball slides on a lot here so he tried not to offer the extra pace. He is happy to contribute to the team. On his experience in the League, he replies that it is really intense as every batter can hurt you. On his bouncer that hit Dhoni on the helmet in the last game, Archer smiles and replies that he just tried to bowl the bouncer and he himself was surprised. 17.47 IST: Nice planned batting as the scorecard suggests. Rohit and de Kock started cautiously, then took full toll of the Powerplay. The 96-run opening stand paved the way for a big total, which was eventually built. Pollard did not fire today but he was not missed, was he? 17.46 IST: 92 in the first 10, 95 in the next 10. Mumbai have played their innings perfectly. At one stage it did seem like they were running out of gas, with the score reading 135 at the end of 16 overs. But 52 came in the next 4 overs, with Helicopter Hardik taking off. 17.43 IST: Jaydev Unadkat to Hardik Pandya, DOT BALL!Mumbai Indians end with 187 on the board. 17.41 IST: Jaydev Unadkat to Hardik Pandya, SIX! Clean as a whistle! That's not the length to bowl to any batsman at this stage. Unadkat commits the sin and pays the price. A slower one alright but it's on a length and in the slot, Hardik clears his front leg and launches it over long on. 17.39 IST: Jaydev Unadkat to Hardik Pandya, FOUR! Power and placement! Lethal combo! Short delivery on middle, Hardik stays rooted on the back foot and packs a punch. He pulls it with authority and bisects the two fielders on the leg side to perfection. The deep mid-wicket fielder tries pulling it back with a valiant dive but fails in his attempt. 17.38 IST: Jaydev Unadkat to Ishan Kishan, OUT! Ishan Kishan holes out! A low full toss this time by Unadkat, it's outside off, Kishan fails to get underneath the delivery properly but still goes on with his attempted lofted shot. It flies off the bottom part of his blade and Buttler has a simple catch to take this time around. The Englishman makes no mistake but the best part for Mumbai is that the batsmen crossed and Hardik Pandya will be on strike. 17.37 IST: Jaydev Unadkat to Ishan Kishan, FOUR! Kishan begins the last over with a boundary. Unadkat serves a length ball at this stage, it around off, right in the zone, Kishan heaves it across the line, doesn't middle it properly but still manages to drag it off the inside half to the deep mid-wicket fence. 17.35 IST: Jofra Archer to Hardik Pandya, SIX! Helicopter Hardik takes off! That is a sensational hit. Jofra misses his length by just a fraction, bowling full and Pandya takes full toll. 17.33 IST: Ishan Kishan walks in at number 6, replacing de Kock. 17.32 IST: Jofra Archer to Quinton de Kock, OUT! That's an outstanding catch in the deep by Jos Buttler. Also, it's smart bowling from one of the best going around in this format. After trying to stay away from de Kock's hitting zone on the previous ball and going for a boundary, Archer this time decides to follow the South African down the leg side. A length ball, without much pace, de Kock tries making room for a powerful shot over the bowler's head but completely mistimes it in the air towards long off. 17.32 IST: Jofra Archer to Quinton de Kock, FOUR! Well played in the end! Archer sees the movement from the batsman towards leg and hence bowls it wide outside off. Quinton still manages to reach out for it as he pumps it over covers for a boundary. 17.22 IST: Dhawal Kulkarni to Hardik Pandya, SIX! Hardik Pandya is a clean striker of a cricket ball. This shot just shows that. Kulkarni lets out a slower length ball on off, Hardik uses the depth of his crease as he winds up for a big shot and muscles it over over mid-wicket for a maximum. 150 up for Mumbai! 17.22 IST: Jofra Archer to Kieron Pollard, OUT! High, high, high and taken! No Pollard magic today. A very good catch from Shreyas Gopal, almost identical to the one against Chennai where he ran backwards to dismiss Ambati Rayudu. A short ball, outside off, slower in pace, Pollard looks to pull but the slowness of the wicket does him in. Gets a top edge which balloons in the air. Two men are going after it - Gopal from short mid-wicket running back and someone else coming in from deep mid-wicket. But the calling is perfect, Shreyas dials the number, keeps his eyes on the ball, his calling clear and then takes it wonderfully. How much will this affect the final total? Not quite sure. Because Pollard might be gone. But the one who has stolen his thunder this season is in. 17.20 IST: Jofra Archer back on for RR. 17.15 IST: Jaydev Unadkat to Quinton de Kock, FOUR! Top edge and four but Mumbai won't mind. Unadkat starts off with an off cutter outside off, de Kock goes for the big heave but only manages a top edge behind the keeper. The ball rolls towards the third man fence for a boundary. 17.11 IST: Strategic time-out! Time for a discussion. The punch of the gloves. Mumbai prepare themselves for a carnage. 5 overs left. 175 a minimum. 190 a possibility. 200 cannot be ruled out. Rajasthan have the worst economy in the death overs (16-20) this season. Can they change the script today? 17.04 IST: Dhawal Kulkarni to Quinton de Kock, FOUR! Very poor delivery by Kulkarni. It's a slower delivery but on a good length wide outside off. De Kock exercises his arms and whacks it through extra cover for a boundary. 17.01 IST: Dhawal Kulkarni to Suryakumar Yadav, OUT! Dhawal returns into the attack and tickles the off stump. Yadav is bowled after playing a little quick knock. This delivery is on the shorter side, it lacks the desired pace for the batsman who makes space for the swing of his bat. Does so very early though as the ball arrives late and kisses the off bail. An excellent start to the over for Rajasthan but Mumbai won't mind much as they have plenty of power hitters in their ranks. 16.58 IST: Shreyas Gopal to Suryakumar Yadav, SIX! Lovely straight hit! A flighted full ball on off, this one is right in the zone for the batsman who spanks it over the bowler's head for a biggie at long off. 16.54 IST: Jaydev Unadkat to Quinton de Kock, FIFTY! Fifty up for the southpaw. A well-timed innings as he looked out of tough for the last few matches. But de Kock comes back in style. His 8th in the Indian T20 League. Reaches there by pulling a short ball on off. The ball goes to deep mid-wicket and they take a run. 16.47 IST: Jofra Archer to Rohit Sharma, OUT! A wicket against the run of play! Rohit Sharma has mistimed his lofted shot his time. Archer serves a well-disguised scrambled seam delivery, it's on the shorter side as Sharma shapes up for the pull shot across the line. But the face of his bat doesn't close at the right time and he ends up mistiming it in the air towards long on. 16.44 IST: Krishnappa Gowtham to Rohit Sharma, Great presence of mind! First the bowler senses the charge from the batsman and smartly fires one down the leg side. Rohit advances down the track but after seeing the ball way down the leg side, he immediately kicks it towards deep square leg. Had he not done so, Samson would have got the stumping opportunity. The ball has gone in the deep but they didn't run as the batsman was not offering any run. 16.42 IST: Krishnappa Gowtham to Rohit Sharma, FOUR! Gowtham is taken to the cleaners here! He proved to be expensive in his first spell and nothing has changed in his second. A poor delivery, short and wide outside off, Rohit attacks it and slaps it through point for a boundary. 16.41 IST: Krishnappa Gowtham to Rohit Sharma, FOUR! Slapped and slapped hard. This ones flatter, on off, Rohit slaps it flat and straight over the bowler for a boundary. Fifth boundary for Rohit. 16.40 IST: Krishnappa Gowtham to Rohit Sharma, SIX! Wow, great flourish of the bat from Rohit and the ball goes into the sea of blue at mid-wicket. This one is served right in the slot for the batsman, Sharma picks it up and dispatches it with great swing of his bat, bye bye ball. 16.40 IST: Krishnappa Gowtham is back on. 16.35 IST: Liam Livingstone to Quinton de Kock, SIX! Yet another attempted off spinner goes wrong for the debutant. Reaches the batsman on the full and the South African shows no mercy. He just picks it up and dumps it over wide long on. 13 from the over. 16.34 IST: Liam Livingstone to Quinton de Kock, SIX! De Kock has nailed it! This is now the highest partnership for Mumbai this season. 16.31 IST: Shreyas Gopal to Rohit Sharma, Run out chance? But a poor throw from Rahane helps Mumbai. Sharma pushes this flighted ball towards cover. Rahane, at cover, runs inside and collects the ball with a forward dive, does well to collect it and throw it back to the keeper. 16.30 IST: Shreyas Gopal to resume bowling after the break. 16.26 IST: Strategic time-out! Mumbai are rocking hard here. Two quiet overs, then the carnage. They have got the start they were looking for. Now, to build on this. 16.24 Jaydev Unadkat to Rohit Sharma, Direct hit but no harm done! A length ball outside off has been dabbed down to short third man for a quick single. The fielder scores a direct hit at the striker's end but de Kock was easily in. 16.19 IST: Jofra Archer to Quinton de Kock, SIX! No half measures here. It's on a length and in the line of the stumps, de Kock powers it across the line and smashes it over mid-wicket for a biggie. 16.18 IST: Jofra Archer to Quinton de Kock, FOUR! Rohit is in fine touch here. The one match break has helped him it seems. Kulkarni bowls it fuller and outside off, Rohit drives it past the point fielder and finds the fence. Fourth boundary for him. 16.16 IST: Dhawal Kulkarni to Rohit Sharma, FOUR! 16.15 IST: Dhawal Kulkarni to Rohit Sharma, FOUR! Typical Rohit! Hops back to make room on the off side, receives a slightly short ball around off and lofts it easily over extra cover. It nearly went all the way. 16.13 IST: Dhawal Kulkarni to Rohit Sharma, FOUR! Excellent placement. Dhawal bowls it full outside off, Rohit leans on his front foot and drives it crisply through the covers for a boundary. 16.12 IST: Krishnappa Gowtham to Quinton de Kock, FOUR! Easy-peasy! The line and length from Gowtham is to Quinton's liking. The off spinner fires it flat and full around leg, de Kock stays back and powers it over mid on for a boundary. 16.11 IST: Krishnappa Gowtham to Rohit Sharma, FOUR! Finds the gap superbly, Rohit! Once again Gowtham gets too full and straight, Sharma kneels and effortlessly sweeps it behind square leg for a boundary. 16.09 IST: Krishnappa Gowtham to Quinton de Kock, SIX! High and handsome, first big one of the game! Gowtham dares to pitch it full and on middle, de Kock clears his front leg and sends it packing over long on for a maximum. 16.04 IST: Krishnappa Gowtham to Rohit Sharma, A tossed up ball landing full outside off, Sharma drives it square of the wicket on the off side and finds the gap. A couple of runs added to the total. 16.00 IST: The two umpires are walking on the field. The boys in pink get into a huddle and now the two Mumbai openers, Rohit Sharma and Quinton de Kock are seen climbing down the stairs. Krishnappa Gowtham has the ball for Rajasthan. 15.21 IST: Both the teams have arrived for the clash at Wankhede Stadium. 15.20 IST: Some specials fans are present at Wankhede Stadium today.